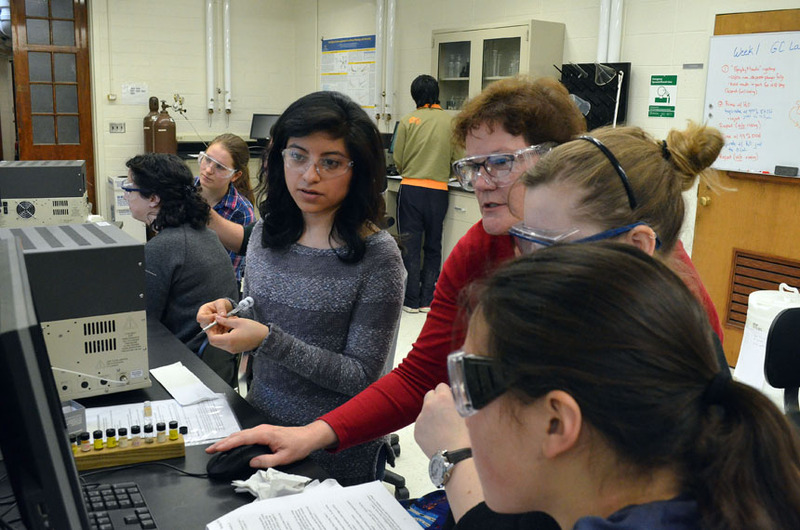 Cindy Fitzgerald helping students Reyna Juarez Martinez, Elizabeth Mauser and Michaela Wentz with an experiment using gas chromatographs. Cindy Fitzgerald has made quite an impact since joining the Department of Chemical Engineering a little more than two years ago as a senior technical associate. “She has truly made junior and senior lab an amazing experience,” says Dominick Salerno ’17. “Cindy Fitzgerald is, simply put, the best,” adds Jean Brownell ’17. This is the third time the award, now in its fourth year, has gone to someone in chemical engineering. Prior to joining the department, Fitzgerald was a hybrid color imaging engineer at Eastman Kodak Co. for 35 years, much of that time as a systems team leader. She would often fly out to Hollywood to visit the laboratories that processed the Kodak film used in the movies shot there. “We were transitioning from analogue film to digital manipulations and digital recording and projection, so that’s where the ‘hybrid’ in my title came in,” she explained. Now Fitzgerald helps set up and conduct undergraduate labs in a department that has seen its undergraduate enrollment increase from 132 to 2010-11 to 230 this school year. She supervises more than 100 students each academic year. In addition to be a good source of ideas and suggestions from her years in industry, Fitzgerald is also “able to provide a sense of humor during frustrating or repetitive processes,” Brownell says.